BLUSTERY conditions made it hard going for some of the entries in the New Norfolk Christmas Parade today. A big crowd turned out in the breezy weather to watch the parade which this year had 25 entries including big numbers of children from local schools, and emergency service volunteers from throughout the Derwent Valley. Flags and banners became hard to manage as the wind whipped up during the pageant's second lap of High St, but the level of enthusiasm remained high with much encouragement from the many hundreds of onlookers. 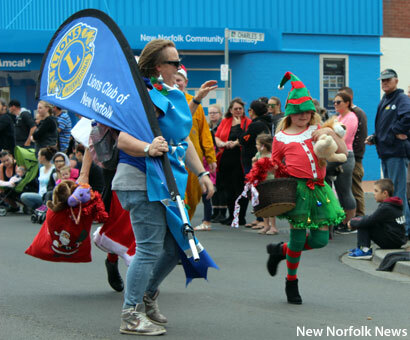 Organised by the Derwent Valley Rotary Club on behalf of the New Norfolk Business Alliance, the parade was broadcast live on community radio station Tyga FM, with station manager Roz Chapman and Craig Farrell MLC giving a running commentary. The judging panel of Senator Jonathon Duniam, Lyons MHR Brian Mitchell, former senator Jacqui Lambie and Derwent Valley mayor Martyn Evans named Glenora District School as once again having the best presentation in the parade, followed by Fairview Primary School and New Norfolk Primary School. New Norfolk's new Saturday market was suspended due to the parade but will return next Saturday from 8am-2pm in the town centre. "Selfies with Santa" be available at Santa House, 22 High St, from 11am-3pm daily until Christmas Eve. A giving tree and a gift-wrapping will also be offered. Click here for the New Norfolk News gallery of photos from the parade.